On 11th November 2014, Bhutan celebrated two special occasions, King Jigme Singye Wangchuck celebrated his 59th birthday along with prince Ugyen Jigme Wangchuck, who celebrated his 20th birthday, as both father-son duo share their birthdays on the same date. 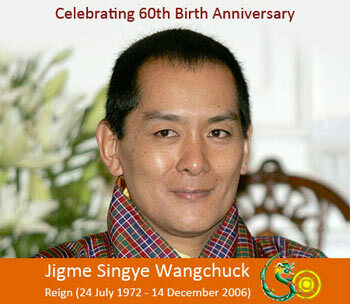 On this very day, the Government came up with a special tribute to commemorate the 60th birth anniversary of his majesty - Jigme Singye Wangchuck, the fourth dragon King of Bhutan. The entire Kingdom of Bhutan will be celebrating the year 2015 as Visit Bhutan Year to mark this special occasion in the history of Royal Family. Special cultural programs will be held all over Bhutan to mark this special day in Royal Family. The year 2015 is a special year in tourism industry of Bhutan as the Royal Government celebrates the 60th birth anniversary of his holiness Jigme Singye Wangchuck, 4th King of Bhutan. The beloved King turns 60 on 11 November 2015. To mark this historical event in the country, large number of cultural programs and celebrations are expected all over Kingdom of Bhutan throughout the year 2015. This day will conclude all celebrations and activities that Royal Government of Bhutan is organizing to mark this golden day in the history of the country. People of Bhutan will be celebrating together with the royal family to mark this golden day in the history of the country. Paro and Thimphu will be center stage of all the celebrations in the nation. The country�s cultural capital will be observing a wide array of cultural programs, prayers and other activities. The entire country wants to thank his majesty on his 60th birthday for his efforts and contributions towards the development of a prosperous nation - Bhutan.